The Vaccine Education Center at The Children's Hospital of Philadelphia’s (VEC) mobile app, Vaccines on the Go: What You Should Know, is now available for Android in addition to Apple platforms. Vaccines on the Go: What You Should Know is a unique mobile app that allows busy parents to access up-to-date, reliable information about the science and safety of vaccines -- wherever and whenever they need it. The new app places the extensive resources from the VEC web site at parents’ fingertips in an easy-to-navigate mobile platform that parents can access at the doctor’s office, grocery store, or pharmacy, allowing parents to find immediate answers to questions wherever they arise and to help them make informed decisions regarding their child’s immunizations. 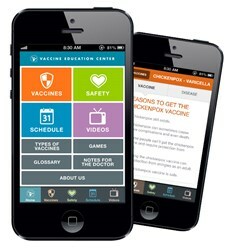 Parents can download the free app from the iPhone or Android stores or can learn more or easily locate the links to the app in app stores by visiting the VEC’s mobile app web page http://vaccine.chop.edu/mobileapp. The Vaccine Education Center at The Children's Hospital of Philadelphia (VEC) was established in October 2000 with the goal of providing scientifically accurate and up-to-date information about vaccines and the diseases they prevent to both parents and health professionals. The Center offers numerous resources, including websites, videos, e-newsletters, informational tear sheets, webinars and speakers programs, all of which provide information that dispels common misconceptions and misinformation about vaccines. Information commonly found on VEC resources include how vaccines are made, how and why they work, who recommends them, whether they’re safe, whether they’re necessary and when they should be given. The Vaccine Education Center is funded by The Children's Hospital of Philadelphia and does not receive support from vaccine manufacturers.